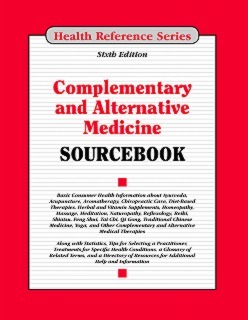 Complementary and Alternative Medicine Sourcebook, 6th Ed. Complementary and Alternative Medicine Sourcebook, Sixth Edition provides updated information for people considering these therapies for general well-being or specific health conditions. It discusses how to select a CAM practitioner, talk with a primary health care provider about using CAM, evaluate information on the internet, and pay for CAM therapies. It describes whole medical systems, such as Ayurveda, traditional Chinese medicine, Native American medicine, acupuncture, homeopathy, and naturopathy. It also talks about the safe use of dietary supplements, including vitamins, minerals, and herbs. Information on biologically based therapies, mind-body medicine, manipulative and body-based therapies, and energy-based therapies is also included. Additional features include a glossary of related terms, directory of additional resources and online access. Part I: An Overview of Complementary and Alternative Medicine (CAM) defines CAM, identifies common therapies, use of CAM in the United States, and answers questions consumers often have about choosing a CAM practitioner and paying for treatments. statistics on CAM use in specific populations, including women, children and the elderly, is also included, along with tips on avoiding health fraud and spotting Internet scams. Part II: Alternative Medicine Systems describes whole medical systems practiced in cultures throughout the world that evolved separately from conventional medicine as it is practiced in the United States. These include Ayurvedic medicine and their product caution, traditional Chinese medicine, Native American medicine, acupuncture, acupuncture for cancer, homeopathy and their product caution, and naturopathy. Part III: Dietary Supplements identifies vitamins, minerals, herbs and botanicals, and other food and dietary substances taken to improve health or nutrition. Readers will also find tips on ensuring supplement safety and selecting specific products to support bone and joint health, immune system functioning, mood regulation, probiotics supplements for gastrointestinal health, and weight loss efforts, sports and energy supplements, using dietary supplements wisely, fraudulent in dietary supplements. Part IV: Biologically Based Therapies discusses CAM practices that strive to enhance or improve health using substances found in nature. This part highlights biologically based techniques including apitherapy, aromatherapy and essential oils, and diet-based therapies such as detoxification diets, fasting, popular fad diets, Gerson therapy, and vegetarianism. Part V: Mind-Body Medicine describes CAM techniques that focus on using the mind to improve health or reduce unwanted symptoms, such as biofeedback, deep breathing, guided imagery and hypnosis, meditation, prayer and spirituality, relaxation training, shiatsu, tai chi and qigong, tui na and yoga. In addition, readers will find information about practices focused on healing via creative expression in art, music, and dance. Part VI: Manipulative and Body-Based Therapies offers information about the Alexander technique aquatic therapy, massage therapy, chiropractic care, craniosacral therapy, Feldenkrais method, and kinesiotherapy, pilates, reflexology, lymphatic drainage, massage therapy, rolfing structural integration and other CAM therapies that involve movement or manipulation of one or more parts of the body. Part VII: Energy-Based Therapies discusses CAM therapies that encourage healing through the manipulation of energy fields. CAM practitioners of reiki, polarity therapy, and therapeutic and magnet therapy. Part VIII: Alternative Treatments for Specific Diseases and Conditions highlights scientific research of CAM therapies for treating arthritis, asthma, cancer, chronic pain, cognitive decline, diabetes, fibromyalgia, headache, hepatitis, infertility, low back pain, menopausal symptoms, seasonal allergies, and sleep disorders. The use of CAM for treating mental health problems, including anxiety and addiction, is also discussed. Part IX: Additional Help and Information provides a glossary of important terms related to complementary and alternative medicine. A directory of organizations that provide information to consumers about complementary and alternative therapies is also included. Volumes published after June 2015 include access to Health Reference Series Online. Easy-to-use volumes organized into parts and chapters. Parts focus on broad areas of interest. Chapters are devoted to single topics within a part. Authoritative content from respected government agencies and institutes, university research centers, professional medical associations, and non-profit health organizations. Comprehensive chapters feature generous use of headings and subheadings for ease of navigation. Tables, charts, and illustrations display statistical data and supplement explanations. Helpful glossary provides definitions of technical terms. Resource directories with contact information highlight organizations that can provide further information and support. Professionally prepared master index provides easy access to descriptive information, definitions, and related concepts.